Oh, how I missed sitting in front of a computer typing thoughts and ideas to an audience I'm not even sure is there. I took a two months break because sometimes you need a little break when life get's hectic. That was definitely where my life was in the past few months. I moved to Iowa for school leaving my family behind, I got engaged and threw myself into wedding planning quite quickly, I had a horrible experience with my former roommate, and being in a university was quite an adjustment. It was a rough transitioning period and a lot of things I had to take on. However, I'm back and hopefully on the way to making great weekly content soon. November is finally here!! It's time to dive in and make some monthly intentions. 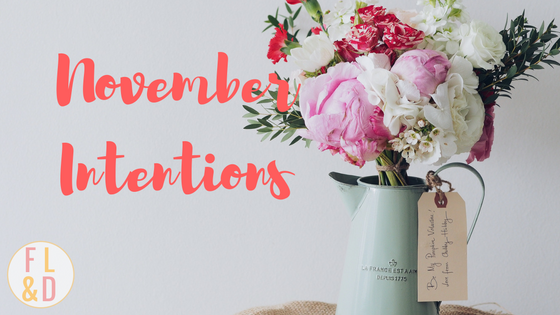 I'm teaming up with some lovely ladies this month in sharing our monthly goals. Check out their inspiring blogs as well as their inspiring goals for this month. So I'm going to start out with a high and low from October. -I turned 22!! I didn't do anything special for my birthday but I was surrounded by those who loved me and that's all that really mattered to me. I also got a phone call from my dad and I hadn't heard his voice in almost a year so it was a great birthday gift. -I picked out my wedding dress. I'm not allowed to go too much into detail on here because my fiance reads my blog and we're trying to keep the dress a secret. However, my dress is everything I could ever imagine. It's perfect for our venue, I can move in it (because that was a biggy for me. ), I feel comfortable, confident, and I just see myself walking down the isle in it. -I lost motivation for school. I always hit a wall eventually when it comes to class work and class in general. Sometimes it's exhausting and I'm not really sure if it's all worth it. Somedays I can see it is worth it but other days I question. So October was really a hard month for me as I turned 22 and realized I'm not anywhere where I want to be in life. This is both good and bad because I can change it from here on out but still a low point in my life. Now on to my November goals. This originally wasn't on my goal list for this month. I feel like with everything happening in the world currently we need a little more positivity. So it's the perfect time to start doing some random acts of kindness let people know there is still some good in the world. Currently, we've been stressing about money and lack of time. The process of planning our wedding has not been enjoyable at all. It has its moments when we're like YAY! but it also moments where we stress and argue over certain things. I always try to keep in mind that a wedding is for only for a day and we should be planning for a marriage. So recently I've been trying to think of ways we can make wedding planning relaxing and fun as well. 3. Make a winter bucket list. Since summer I've been making season bucket list of things I want to do each season. It's been our go-to list for date ideas and just making sure we get out and have some fun. I've been in the process of making my winter bucket list as December is approaching quite rapidly. So I've been taking a Psych of Gender class where we talk about the differences and similarities between males and females. Last week we talked about communication differences which was a huge revelation for me. For example, males never give eye contact when they're talking to other males however it doesn't mean they don't listen some males just find eye contact uncomfortable. However, for females eye contact is how we show each other we're listening and it builds intimacy within the relationship. I noticed this with my fiance, he can't stare at me when I'm talking to him sometimes. I get upset because I think he's not listening when in reality he is, it's just our communication styles are different. This happens with a lot of other things. So learning what I did in that class helped me to understand my fiance and males, in general, a bit better. So I'd like to apply what I've learned to how we interact together. I hope November is filled with pumpkin spiced everything, lots of delicious food, good company, and lots of love. Don't forget to share some of that love with the lovely ladies joining me in sharing our monthly goals. What is one favorite family tradition for the holidays?